The lobby of the Fairfield Inn in Savannah, Georgia filled with 40 cyclists wearing high visibility orange, yellow and green clothing, and bicycles tricked out with the latest blinkies. The riders were anxious to begin the first leg of this WAY tour (Week-a-Year) from Savannah to Hinesville. While the final destination is set for Titusville, Florida — today’s ride was all about riding safe, as a group and resuming conversations exactly where we left off a year ago. The complimentary breakfast at our Beaufort hotel buzzed with cyclists half-woke, half-dressed wearing a pungent o-dear that was reminiscent of yesterday’ ride, walking straight toward the make-it-yourself waffle iron, the trays of english muffins and miniatures dollops of peanut butter where peanuts were the last of a 12-ingredient list that began with the words ‘corn syrup’. Today’s breakfast was our best by far — it included jellies that were close-enough to be considered fruit, and we slathered sugar-slime onto miniature brown and yellow muffins with more unrecognizable ingredients. 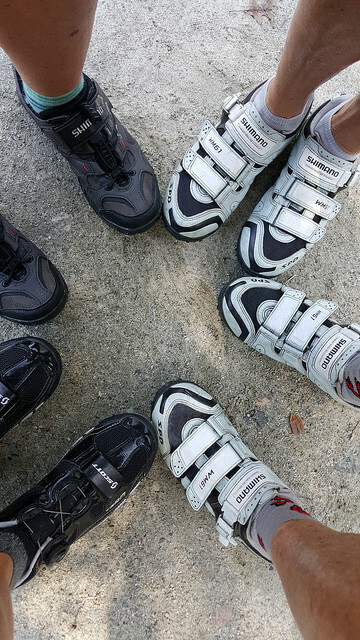 Someone cut in line, a fellow biker with mismatched socks, and we waited patiently while he grabbed a second slice of wonder bread mumbling “bless his heart”, because after all it was Day 6 of hard riding. Everyone was growing weary, and that’s how one rolls in the south. The morning ritual begins. Rummage through your bag looking for dry shoes and dry clothes. Wonder why all your clothes are wet, and realize the wet ones fused with the dry collection. Do the sniff test. Everything smells gamey. Open the hotel door to check the outside temperature, and watch the humid steamy air roll in. You feel your body temperature rise, and you instinctively wipe the steam off your forehead. Close the door, fast. Staying dry is out. It’s all about the nose. Choose the least gamey outfit and hope your bike-mates won’t draft too close. Day 6: Sometimes the challenge-du-jour appears where you least expect. Navigating the hotel elevator: By 8:30AM, I would need two trips down the elevator from my 2nd floor hotel room, to get my luggage to the luggage truck (trip #1), and my bicycle to the outdoor world (trip #2). Trip #1 was easy. My luggage had wheels, and despite the fact that it felt heavier each day – at least the beast rolled. All was going well during trip #2 (the bicycle). Except for one problem. I was also trying to hold a cup of coffee. Not just any cup of Joe. It had been a week since I had tasted good coffee. 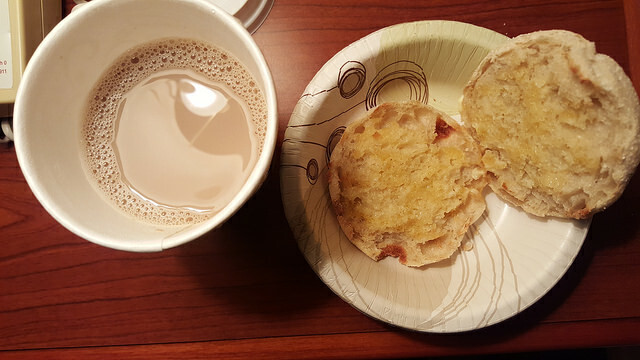 I clung to this caffeine treasure, and convinced myself I could also navigate the hotel elevator with my bicycle. I boarded the elevator with my bicycle (front wheel first), and even managed to hold my bike, hold my coffee and press the “Lobby” button. Suddenly my front headlight fell off the bike and landed on the elevator floor. I stared at it – but that did nothing to return the headlight to my bike. I would have to somehow hold my bike, hold my coffee, bend over and pick up the light. The elevator door opened as I reached the Lobby – but I couldn’t exit. I hadn’t figured out how to pick up my headlight. Now the doors have closed and the elevator is going back up. I had visions that I would be spending the day in the elevator. And, no – the thought hadn’t crossed my mind to abandon my coffee. At the 4th floor, a lovely lady got on. I asked her if she wouldn’t mind holding onto my bike while I retrieved my headlight. She was apparently new to holding onto bicycles, and as soon as I let go, my bike crashed to the elevator floor. I managed to retrieve the headlight, but now had to pick up my bike, without spilling my coffee and some how re-arrange the wheels so that I could exit. Reaching the lobby for the 2nd time, the elevator doors open, and the lovely lady departed. Unfortunately, I could not drag the bicycle out before the doors closed – so I travel back up to the 4th floor. Nobody gets on. I spend my solo elevator time trying to come up with a new game plan. If I could only get the front wheel of my bike closer to the elevator door. I work on re-positioning my bicycle while descending back to the Lobby and the doors open once again. The third opening of the elevator doors at the Lobby was the proverbial charm. A fellow cyclist waiting to hop on the elevator offers to hold my coffee, hold the elevator door and I handed him the loose headlight for good measure. I dragged my bike away from the confines of the elevator, returned to sipping my coffee, and pretended that none of this happened. Day 5: Our departure from Clarksville VA at 7:45AM was greeted by warmer temperatures and a bittersweet taste of excitement for what would unfold — and the realization that our cycling tour is closing in on the finish line. Including today’s ride — we have 2 days of riding before our ECG WAY Tour 2015 comes to an end. Today’s ride would take us to Durham – 61 miles. Day 2: …was one of the highlights of today’s cycling ride – from Richmond to somewhere south of Petersburg, Virginia. Whatever ‘hit’ was lacking in my wake-up routine, was made up for in the adrenaline that helped to cross the mighty James River in Richmond. After days and days of rain courtesy of Hurricane Jo’ (aquin), the James River was a swollen beast. Today’s ride however, would be free of rain. With temperatures in the 50s, more winds from the north (i.e. 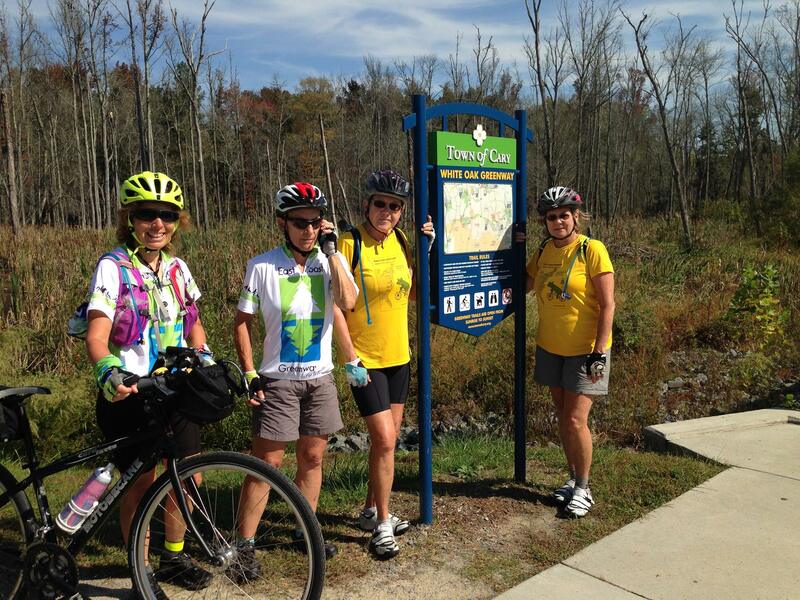 tailwind) – a group of 4 ladies (Donna, Bev, Barbara and myself) with the East Coast Greenway (ECG) WAY tour departed on busy rush hour Richmond city roads for more bicycle miles south. 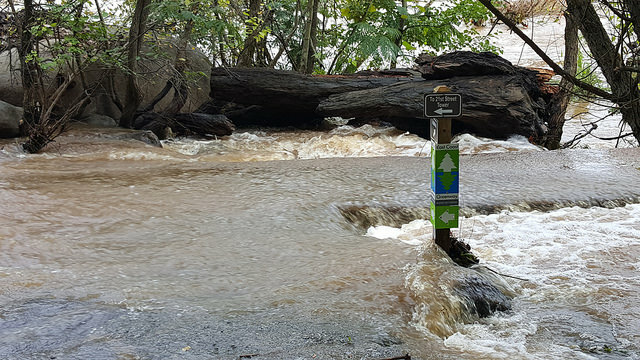 Within 2 miles – we stopped to listen to the roar of the swollen James. 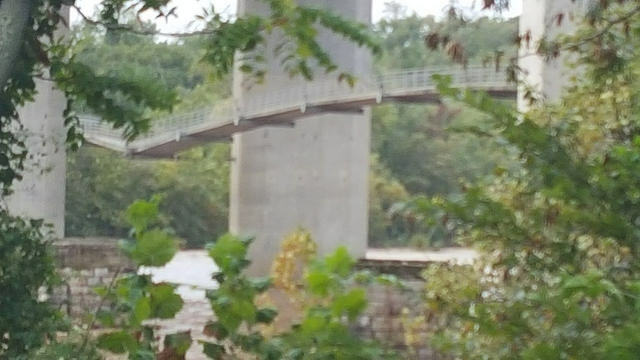 We photo-op’ed the pedestrian bridge that appears to hang precariously (suspension bridge) under one of the interstate highways, and before any of us could have second thoughts – it was time to cross the mighty James. 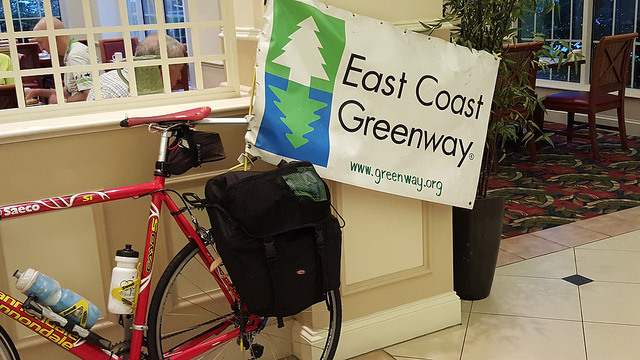 Day 1: With lots of hope for good weather, our 36 person group of East Coast Greenway cyclists, departed Fredericksburg at 7:30AM in pouring rain. Today’s destination was Richmond VA – 70 planned miles. Note the word ‘planned’.